Children love being outdoors, discovering, observing, learning. Math Adventures–designed with these innate qualities in mind–gently guides parents and children through multi-sensory math lessons incorporating narration, hands-on experiences, oral drill, and life application. Featured adventures include state and local parks, beaches, nature study, butterfly habitats, bird study, U-Pick farms, farmers markets, county fairs, and chickens. Math Adventures: Experiencing Math in Nature complements Blaze New Trails. 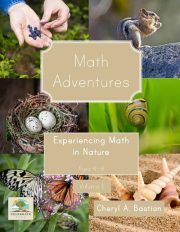 An exciting NEW addition to our products, Math Adventures: Experiencing Math in Nature is ideal for learners ages four to eight. Black and white print, spiral bound.